This past week, the Upper Villagers took a trip to Boston and Cape Cod that lasted for five days. It was a fun experience in which we took tours, went shopping and ate a lot of food. In the article below, we will share our stories and shine a light on the times we had. On day one, we all woke up early to get onto the bus by 9 o’clock. The ride was long, with only a lunch break at McDonald’s or the adjoining gas station. After lunch, we were off again. We went to the mall after our tents were put up, where we shopped and ate dinner. Back at the campsite, we had a circle-up and ate s’mores. Day two started with an early wake up at 7:15 for a quick breakfast before heading off to Martha’s Vineyard for a day of shopping. When we arrived at the ferry, all of the campers were already anticipating a great day. The boat ride, which was calm and breathtaking, lasted for 45 minutes. At Martha’s Vineyard, we were put into walking groups that were mixed with Upper Village Boys, Upper Village Girls West and Upper Village Girls East. This gave us more time to bond, and to get to know people that we normally did not talk to at camp. Around 3:30pm, everyone regrouped and boarded the ferry for the ride back. From there, all of us went to a minor league baseball game. Sitting on the grass, it was a great place to watch all the action. One of the counselors almost caught a foul ball. The day ended with dinner at one of three choices and a quiet campfire back at the tents. The next day, we took a tour of Boston using special buses that drove on land and also went in the water. Many campers even had the opportunity to drive the boat once it was in the water. The guides were funny and informative. After the tour of Boston, we toured Fenway Park where we learned about the structure and its history. We spent the rest of the day shopping at Quincy Market, where we could choose from all sorts of food options and sugary snacks. Some walking groups stopped to watch street performers, in addition to shopping. 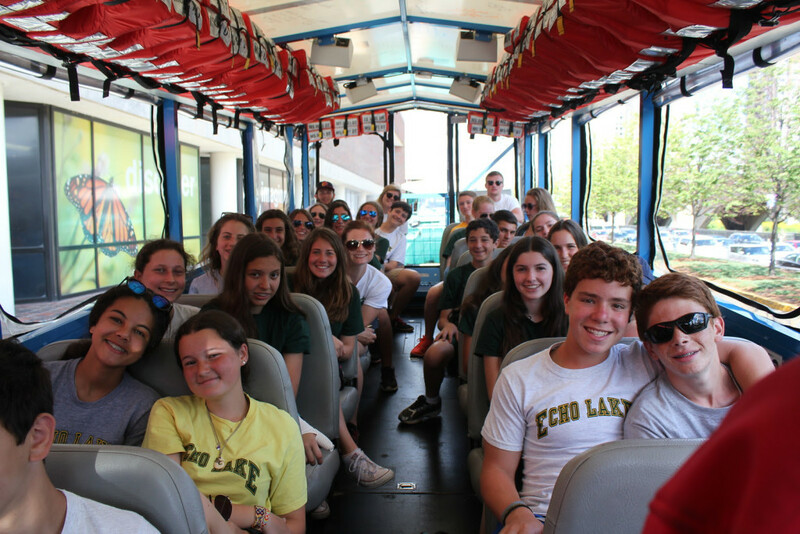 The fourth day was jam-packed, and started with a bus ride to the aquarium. At the aquarium, we split up again into groups to tour the exhibits. There were many types of fish and sharks to observe. After the aquarium, the group went back to Quincy Markets for a quick lunch before visiting the Museum of Science. The rest of the afternoon was spent at the museum touring the different exhibits and working with the hands-on activities. A couple of groups went to a 4D movie, while another group went to a Pixar exhibit. At the end of our time at the museum, everyone had many funny stories to tell about their experiences as we made our way to the Hard Rock Cafe for dinner. Many campers made their way to the gift shop, while others preferred to stay in their seats and watch the music videos playing around the cafe. Since there was a birthday in the Upper Village Boys, the whole trip sang Happy Birthday (Echo Lake style). As our group filled up half the restaurant, we were heard loud and clear by the employees and people eating dinner there as well. It was definitely a sight to see. Boarding the bus with our chocolate chip cookies and Hard Rock Cafe gift bags, it was the end to our last day in Cape Cod. Sadly, like all good things, the trip had to come to an end. Tents were packed up and sleeping bags stuffed as we left the camp ground for the final time. The bus ride back to camp was quiet, with many movies and a quick stop for lunch. Getting back at around 4pm, a cheer went up in the bus. Although our Cape Cod trip had been amazing, and left us with many unforgettable memories, it was definitely a great feeling to come back to camp.